Well Appointed Home w/Salt Water Pool & Separate Pool House &NEW PUTTING GREEN! 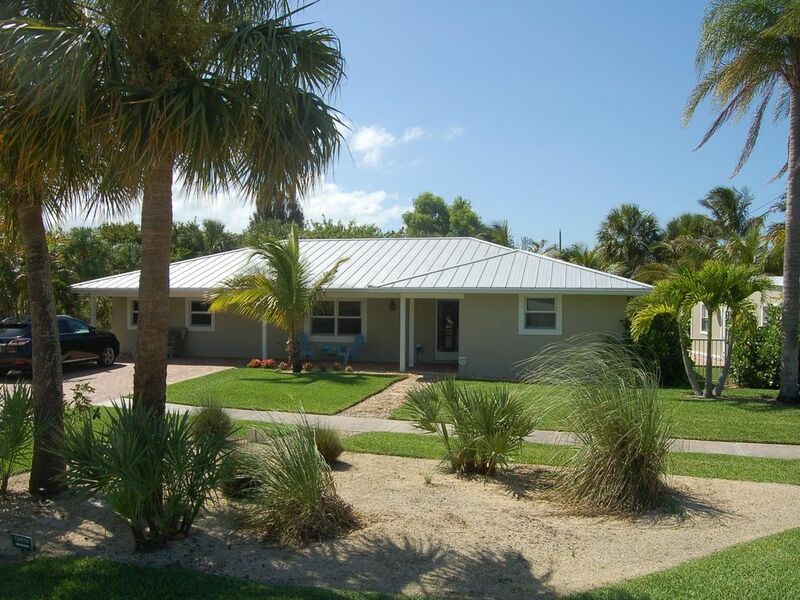 You will love this great vacation home that is just a short bike ride to the beach.If you want good exercise and beautiful scenery the walk to the beach is just 1 mile and the streets are canopied with Banyan trees! Private boat ramp in the neighborhood that drops you into the Intracoastal Waterway. This house is located near everything! Walk to parks, dining, shops, church, tennis, racquetball,and basketball courts. To make your vacation as convenient as possible we will provide any and all of the following: bikes, kayaks, tennis racquets, basketball, volleyball, golf clubs (right-handed & left-handed), beach chairs, cooler, toys and games. We are child friendly and upon request can provide a crib/pack-n-play, high-chair, car seat, etc. Other services like daily or routine cleaning, running errands and shopping available for an extra fee. This beautifully landscaped home is very private and tranquil. Relax by the heated pool or have a drink under the covered back porch and take in a game on the flat screen. This home has plenty of parking for your boat or RV/camper. **** ADDITIONAL HOME FOR RENT JUST TWO STREETS AWAY FOR LARGE PARTIES/REUNIONS!!!!!!!!!!!!!!!!!!!!!!! I am a local realtor with a great knowledge of the area. If you are looking to buy in South Florida I will be happy to help. This is a little piece of paradise.Hobe Sound is a great little Beach Town.It is quiet but close to all of the action! I am an avid golfer with a vast knowledge of almost all of South Florida's golf courses. Please don't hesitate to ask any questions concerning golf or any of the local attractions and activities. ADDITIONAL HOME AVAILABLE JUST 2 STREETS AWAY FOR REALLY LARGE PARTIES!!!!!!!!!!!!! Downtown Hobe Sound is Quaint and Charming-Don't Blink. Even an extra Refrigerator in The Pool House! over a hundred books for you to enjoy! dozens of games including a Wii gaming console. Intracoastal Waterway at the east end of the neighborhood and we have membership to a private boat ramp. cleaning and concierge services available. This includes grocery shopping , errands, airport transfers...etc. This is a great home. We had 8 stay in the home, but entertained 12 and the place was perfect. Lots of room, well equipped, and well maintained. Jeff was a great host and went out of his way to be sure that we were comfortable and had what we needed. Also, Hobe sound is a great community. Not a lot of night life, but if you are interested in enjoying time around the house, going to the beach, or taking long walks this is a great place. What a wonderfully expansive home! So easy to entertain in, yet comfy spaces for those needing a little down time. Wonderful pool & hot tub, immaculately clean; and the BEST kids (big and little!) play house! Our Thanksgiving Day meal was picture perfect...so much to be grateful for! Jeff was a wealth of information about local restaurants & sights. Hobe Sound is our new "go to place!" Family centered, friendly, small, easy traffic but close to evrything! Terrific! Outstanding! We really enjoyed our stay at the house! The house was great! Very clean and owner was very responsive to our questions! We had 3 couples with their own room and private bath and plenty of things for a 17-month old little boy! The house had a pack n play. High chair and plenty of toys! Loved the pool, also! We were very comfortable! Amazing memories made in an amazing place! Our week in Hobe Sound was a family reunion and celebration of my birthday. And this property was the perfect setting. Plenty of room for us all, quick beach access, gorgeous pool, and everything we could have wanted in amenities. The area was magical and Jeff was a wonderful host. We will definitely be returning! Again my wife and I are so happy when we get a group in to stay at our house in Hobe Sound who appreciate our efforts to make everyone's stay a good one. We love the house ourselves and our charming little Beach town! Judy's group was a last minute booking as they had plans to visit the west coast but the Red Tide was in full effect. I am so glad they decided to come to our coast. They liked it so much I may be helping them buy a place of their own! They were super easy to communicate with and left our home in fantastic shape. They are welcome here any time! Great house close to beach with lots of amenities. We are so happy Melissa and her group had a great time and enjoyed our house. My family travels quite a bit and we always try to appoint our Vacation Rentals with all of the things we would want on our vacations. A good spot for a family with children. The house is well-appointed and nicely decorated - especially the kitchen and common area - but nothing that makes you afraid to let your kids roam or touch . Plenty of sleeping combinations available via the beds, cots, & pull out. Pool house and closets have lots of used toys that are fun for the kiddos. Pool is very usable, and the nearby beaches are great, with lots of outdoor adventures available.. We had no trouble scheduling a week of activities for our family of 6. Great dining and golf all around. 10 minutes to Harbourside!